Curt Littau’s personality and people skills make him a good auctioneer. 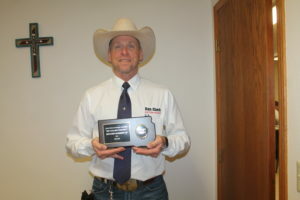 The Winner man was recognized by his profession at the state bid calling contest. Littau won second runner-up in the South Dakota state bid calling contest. The event featured 20 contestants and was held at the State Fair in Huron on Sept. 2. In the first round, each auctioneer brings three items to sell. The items that Littau sold were a set of toy tractors, an antique bucket with wine and wine glasses and a decorative wall hanging. The field of contestants is cut to five and they have to sell two items. The contestants are judged on their chant, presence and the rapport they have with the audience. “In the preliminary round, I had a good rapport with the crowd. Knowledge of what you are selling is important,” Littau added. This is the first time Littau has entered the state contest which is sponsored by the South Dakota Auctioneers Association. Littau has been an auctioneer since 1990. He went to auctioneer school in Kansas City for two weeks. While in school, the students would spend the evenings working at small auction houses. As an auctioneer, Littau has worked a lot of farm sales, benefits and sold cattle. He sells at the Presho Livestock Auction for their special sales. He has been invited to be an auctioneer in Ft. Pierre. For a while, Littau had his own auction company. In April of 2016 he started working for Dan Clark Auction and Realty, where he currently works. Littau says he is the first generation in his family to be an auctioneer. As an auctioneer, Littau enjoys the people. There are a lot of on line auctions but Littau prefers the personal contact with people. The auctioneer is the vice president of the South Dakota Auctioneers Association.